Let’s be honest here: everyone of us has Googled themselves. If you are reading this blog, meaning you have basic the Internet skills of surfing beyond the big brand media sites, then you’ll surely have noticed that the web is actually made of people, not computers. Being one of them entitles you to reflect yourself on a mirror, which in the virtual world means basically punching in your name to the search box and hitting enter. The first hit goes to a namesake of mine. Nothing unexpected there, as there’s plenty of us. My personal domain niiranen.eu comes in on places 3 and 4, after that we move to the usual LinkedIn and Facebook profiles. But wait: what the —- is Bantam Live, and why does Google think it’s the second most likely page that a person would be looking for when searching my name? Ok, here’s the story. 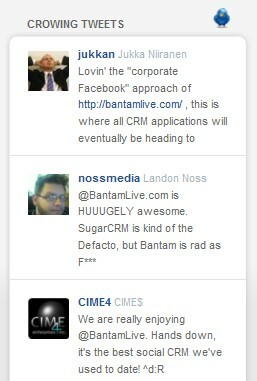 Bantam Live is a hosted CRM service, which is nothing like the traditional Enterprise Software that CRM used to be like in the 90′s and early 00′s. It’s in fact more like the social network services that people like you and me are actively using when not in the office. I tried the service, loved the concept and decided to show some respect by writing a tweet about it. So what, there’s a million tweets every minute, right? Well, it just so happens that smart companies nowadays are listening to the conversation that takes place in Twitter. So was John Rourke, the CEO of Bantam Networks. Not only did he retweet it, but the company decided to quote the tweet on their own site’s front page. Nothing much I can or should do about that, since it’s a piece of text I have intentionally broadcasted to the world to see. 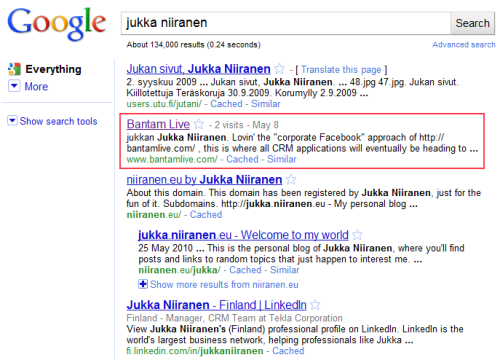 The end result is that now Google thinks I have something to do with the service. But is that actually such a big mistake at all? Isn’t it rather a lucky shot that the search engine has managed to surface such a connection, instead of blindly following hyperlinks and counting words? Sure, there’s absolutely nothing dynamic about the tweet text ending up on the page in this case, but it gives a glimpse of what could be possible with the data that’s already out there in the social network sites. Without having to build a proper semantic web to replace the web we have right now, the mere association of Twitter identities to people and companies could already have a huge impact on how the search engines might begin to understand the online content in a whole new way. The real revolution of course is already taking place. Whether you call it Social CRM or something else, the fact that the customers now have a voice to speak with is creating a big demand for solutions and strategies that allow the companies to listen to the conversation that is taking place out there, and most importantly to be able to react to it. It might be a topic that I should rather write about in my CRM blog, but it’s becoming increasingly difficult to draw the line between fun web apps and serious business platforms. Which is exactly the whole point of the revolution. 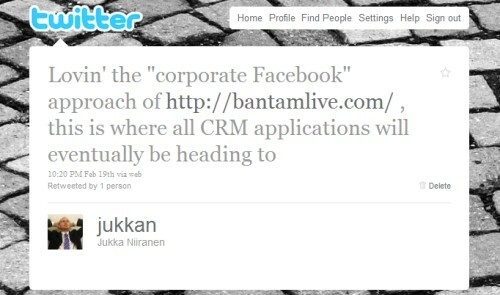 Tagged with CRM, microblogging, SCRM, SocialMedia, Twitter.